How to tighten up SEO practices in response to the search engine giant’s 2011 revamps. Each year Google changes its algorithm — the formula it uses to rank websites — hundreds of times. Most of the changes are small; however, every few months, Google rolls out a major change that affects the performance of websites in its search engine. Below is a summary of major algorithm changes that took place in 2011 and likely affected your site. The year began with a rare turn of events. Two major companies, Overstock.com and J.C. Penney, violated Google’s SEO (Search Engine Optimization) rules and guidelines, which resulted in a Google penalty for both of them. On top of that, as a result of these “black hat” behaviors, Google made changes to the algorithm that affected 12% of the search results in the United States, a far higher impact on results than most of the algorithm changes made by Google. high-quality content ranking higher in the search results. Unfortunately, we see many websites that violate Google’s rules and guidelines as Overstock.com and J.C. Penney did. Some do this because they are uneducated about SEO principles and others work with companies that do not follow white hat techniques (techniques that have been approved by search engines) in order to gain high search-engine rankings in a short period of time. For instance, they may purchase dubious inbound links. This practice might work, but only for a limited time. Google can definitely help you build your business, but it can also destroy it just as quickly. At the beginning of January, Overstock’s pages ranked at the top of results for various common keywords. To manipulate their search-engine rankings, Overstock encouraged websites of various colleges and universities to link to their product pages and in return incentivized faculty and students with a 10% discount on purchases. Websites that end with .edu in their web address are considered more authoritative by the Google algorithm than commercial websites. It’s uncommon that an education site will link in to a commercial website; therefore, sites that have a high quantity of inbound links from .edu domains can dominate the search engines. Google considered this a “black hat” technique, and this manipulation caused Overstock pages to drop from the top three listings on the first page to No. 40 and No. 70 in the rankings. Around the same time, the SEO firm that managed the J.C. Penny website, violated Google’s guidelines by purchasing thousands of low-quality inbound links in order to gain prominent positioning in the search-engine ranking. Just like Overstock, J.C. Penny was No. 1 in the organic rankings on Google until it was penalized. And just as it did with Overstock, this resulted in a major penalty of several pages shifting from being at the top of the first page, to being No. 71 in the rankings. There are many techniques that can be used to gain high Google rankings that don’t violate the search giant’s policies. Original, keyword-rich content is key to success in the search engines. The quality and quantity of inbound links pointing to a website are also important ranking factors in Google’s algorithm. While in general, more links pointing to a particular webpage will mean higher rankings, the quality of those links is just as important. A “quality” inbound link is a link from a website that itself already has a high ranking and often relates to the products, services, or information found on the site being linked to. A small number of quality links will mean a lot more for a website’s rankings than large numbers of lower-quality links. Google has been trying to go social for a while now. Finally in June of this year, Google launched Google+, a social network that allows sharing of photos, videos, links, content, and even chat with up to 10 people at a time. Google+’s focus is to enable users to share information with a targeted group of people in their network. To do this Google created a system called Circles. Circles allow users to drag and drop people’s names into different groups such as family, friends, colleagues, etc. Since beta launch, Google+ has been growing at a very fast pace. According to Google’s Paul Allen, Google+ reached the 50-million user mark in about 88 days. Given this momentum, it’s hard to imagine that Google is not going to end up with hundreds of millions of users. For business owners, this will greatly expand your ability to share information about your company, content, and videos from your website through Google+. At the end of March, Google launched the +1 button directly next to URLs in search results, as seen to the left. By clicking on +1 button, users essentially give a page their stamp of approval. They will then be able to share it with their Circles on Google+, something I will touch on later in this article. When you do a search, if you are logged into your Google account, any results that have been +1’d by you or anyone in your Google+ Circles will be enhanced. Take a look at the example below. This listing has two names, as well as the number of others that +1’d it, attached to it below the URL. These are the people in the searcher’s network who recommended this web page. In addition to standard organic search results now offering +1 capabilities, users can now also +1 Google AdWords pay-per-click ads that show up in the search engine results. Anytime a user does this, their name appears next to the ad; and the names of others from their network will show up next to the ads that they are searching for. This social-networking influence on search results will help improve the click-through rate on ads because we are all more likely to trust advertisements that have been approved by the people we know. You can also put the +1 button on your website. This will allow more visitors to +1 your page and share it within their networks. When visitors come to your page, they will be able to see how many others have +1’d each page on your website; therefore, they will know how popular your website really is within the +1 community. This will create more opportunities for you to generate leads and hopefully sales. Besides helping users to navigate through the website, Sitelinks now gives users an overview of the website’s content and lets webmasters expose visitors to areas of the website that they might not know about. With an August algorithm change, Sitelinks are now full-sized links with a URL and one line of text, making it easier for the visitor to find a section on the website that best matches what they’re looking for. Another change in the algorithm was that now Google looks at the Sitelink ranking and combines it with regular results ranking to create a higher-quality list of links. This helps to reduce link duplication. All of the results from one site will be listed within the first search result as Sitelinks, and all the results from other sites will appear below them. Google will only show Sitelinks when it has determined they are useful for the user. If Google can’t find useful links on your website due to the structure of the website; or if Google doesn’t think your links are relevant to the user’s search, Google will not display them. This change affects how often your website will come up in search-engine results. You have to make sure it’s built in a format that allows Google to find links that can be displayed under the main heading of your website. Since Google is not going to show duplicate listings from the same site, it is very important that you submit a properly formatted sitemap to Google Webmaster Tools. You want to make sure that when a visitor searches for you, your company name dominates the search-engine results page. Google Related is a new feature on the Google Toolbar that allows users to see additional content at the bottom of a browser that relates directly to a web page they are viewing. Whether the user is reading a restaurant’s review, a news article, or reviewing a contractor’s website, Google Related works in the background to find the most interesting and relevant information related to the topics currently being viewed. In the example below, I visited the Saddleback Plumbing website in Lake Forest, CA, and as you can see, Google Related is showing me a map of the business location, reviews from Google Places, images and videos about Saddleback that are available on line, as well as other plumbing and HVAC companies nearby that I might want to try. Results are displayed in the thin bar across the bottom of the screen; as you hover over them with a mouse, they will open up in your browser window. With visitors now using this new tool, you must make sure that you have claimed and optimized your Google Places page. This will allow you to submit correct information about your business to Google. Google Places will also allow you to add images and videos about your company that a visitor might be able to see in the Google Related bar. With these stricter rules, it is more important to manage your online reputation and reviews. You don’t want potential visitors to be exposed to negative reviews that might be published about your company on Google Places. This is something that you can either do yourself or outsource to a reputation-management company that will be able to respond to negative reviews and help you get more positive reviews on the web. Google is under the constant pressure to fight against SPAM, to ensure unique and relevant search results, and to develop new tools that will take web and online marketing to the next level. Because of that, the algorithms will continue to change on the regular basis. You need to make sure that whoever is managing your website is up to speed with all of the latest developments in SEO so that they can quickly adapt them to your website. This will allow you to be competitive in the ever-changing world of Internet marketing. Nadia Romeo is president of iMarket Solutions, which specializes in professionally designed and search engine optimized HVAC and plumbing contractor websites. Learn more about online marketing at www.imarketsolutions.com. 3 ways to promote the positive and respond to the negative. 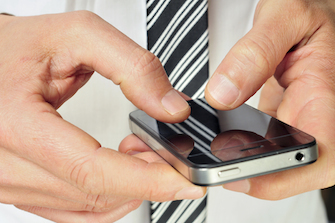 Are Mobile Customers Missing You? Don't miss out on the new opportunities that the mobile web presents. Commit time and resources to designing a mobile version of your site that will benefit your business today and far into the future. Make a commitment and know your limits to get back on track. Stay ahead of competitors with good content, frequent updates, and keyword optimization.